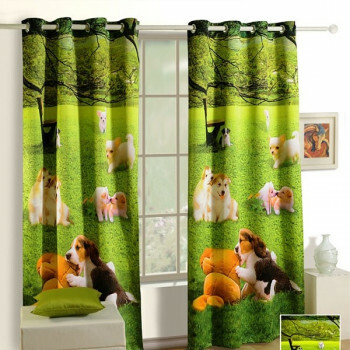 Allow the light of sunrays to shine in your setting and bathe in its beaming radiance. As this tempting and beautiful daybreak takes you to the ride of heaven, leave behind all your worries. 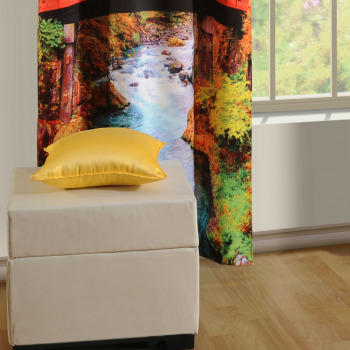 Awakening glow this drapery brings to your milieu is a beautiful way to start your day. From the clear azure sky to the fast running water, this beautiful landscape will fill your heart with joy and hope. Nostalgia of lavender is overflowing on this beautiful drapery to caress you with the scent of love. Bringing you the lavender floats along with the tinge of blue and green, you have now all the reasons to admire the gorgeous spring season. Sweet old garden bushes with the pink and lilac shades are airbrushed here to fill your heart with magic. Give Welcome the golden browns of autumn with your both hands wide open. This is an amazingly captivating view of dried yellow leaves falling over the lime green grass, inspiring you to start with a fresh new beginning. When the leaves turn pale and the flowers lose their brightness, this is a cool autumn weather when faded and curled leaves become the blanket for the shivering earth. 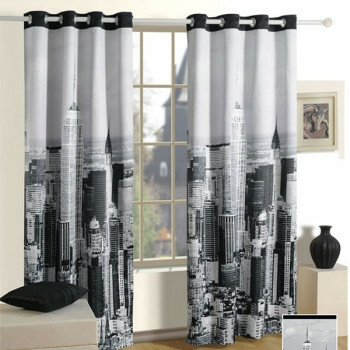 Get ready to indulge into the amazing contemporary feel as you use these high rise curtains in your abode. Buildings, tall and small, competing to touch sky heights, are beautifully captured here. Let the glorious view of this modern life sizzle up the mood inside your setting while inviting the divine luxury to soothe your senses. Feel the fresh air as you surrender your soul to the nature and enjoy the little things nature has to offer us. 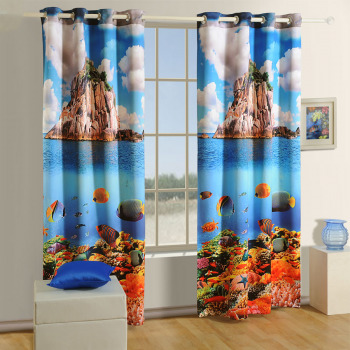 Refresh your perspective and get ecstatic by the print which seems like a make to believe painting done to take your mind away. 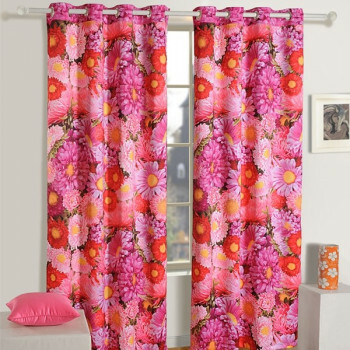 Perpetuate love in your space as you choose our flower-stripes curtain. Accentuate the beauty of your doors or windows with these vibrant colored buds waiting to set an enjoyable view within your setting. From the mesmerizing fragrance of the blooms to their fragile petals, there is everything so unique, appealing and pleasing about flowers. Venice, the floating city in the sea is here to spread its magnetic charm in your milieu. Where the murky water touches feet and pigeons lie at heels, this is a beautiful dawn story of glorious town. 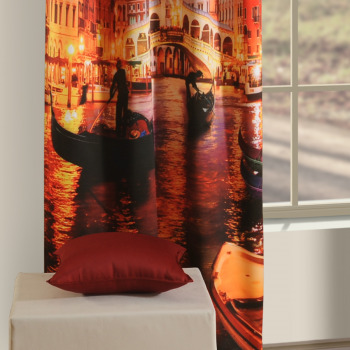 From the wide empty bridges to the golden water, with this drapery one can enliven the love for Venice again in his heart. Pulled right from the rainbow, birds lounge is the assortment of mesmeric hues of life. This is a vivid invention to bring the liveliness in your over occupied, slow pacing lifestyle. Get inspired from these dazzling colors and bring the tempo in your persona. Various carroty birds are flying freely in the wide open sky, inviting you to unwind all the knots of life to understand its real meaning. 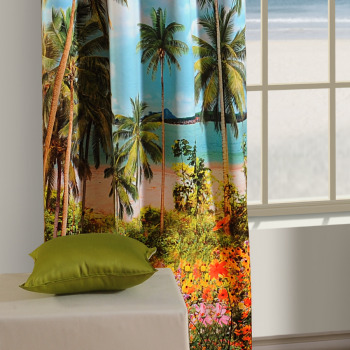 Bring down the temperature of your room with this fresh beach view. The clear blue sky above and sea green water at the bottom will transfer the breezy winds right from the tropic areas in your space. How can we forget here the green palm coconut trees climbing up rhythmically? This drapery is a concoction of cool hues, describing the seashore beauty at its best. 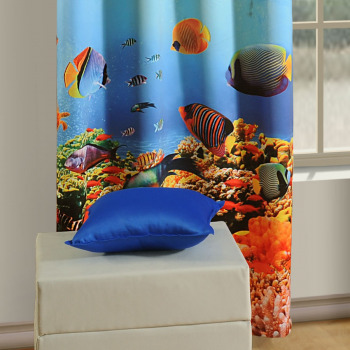 Let’s get drenched into the colorful world residing under water. Full of vibrancy, glowing and amazingly beautiful creatures; aquatic life is quite tempting. Cool blue water giving home to many small and big vivid fishes forces you to wonder how exciting it is actually to live under sea. What else can best define the divine love of dogs other than this drapery? Featuring prettiest puppies on the green pampas, it is truly a pleasure to have this visual always in front of our eyes. When you roll down the window, if salty ocean scent mesmerizes your senses, then you know you are somewhere near the beach. The nature’s mother place where sun is most powerful and breezy winds are its best, beach is an ultimate place to refresh our mind. Are you tired of looking at your idle windows and want a new view to look at? Drape them with curtains but not just plain curtains. 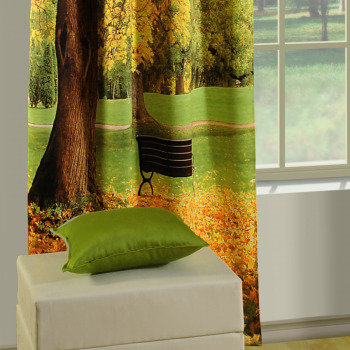 Let the naturalistic and blending designs of lounge curtains take you to a faraway land and transform your home. 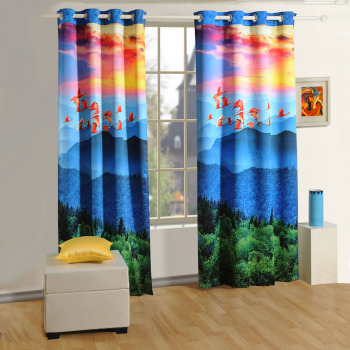 Buy lounge curtains from our online shopping portal Swayam and spread the elegance with the wonderful colors. 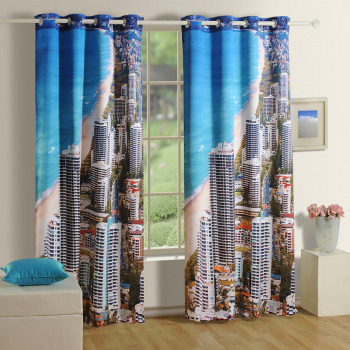 The curtains are based on themes, some show scenery, cities and beauties of the natural world. 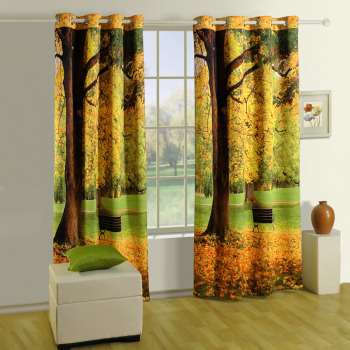 Some curtains are also incorporated with patterns that merge well with your interiors. 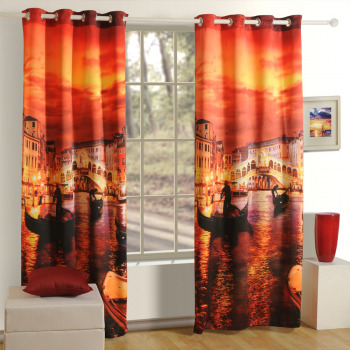 All these drapes are fitted with eyelets that give them a wavy look. 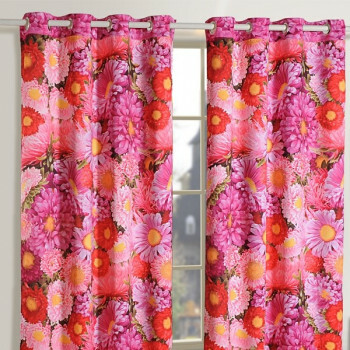 The eyelets also make sliding the curtains very easy as they are supported by rods. 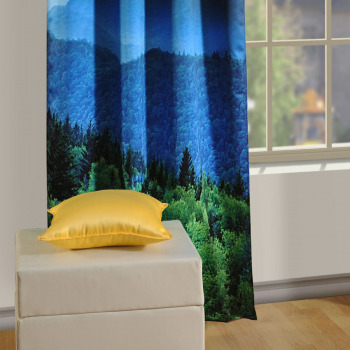 These window curtains online are woven following a three layer weaving using high quality faux silk. This makes the curtains reversible and adds the feature of blackout. 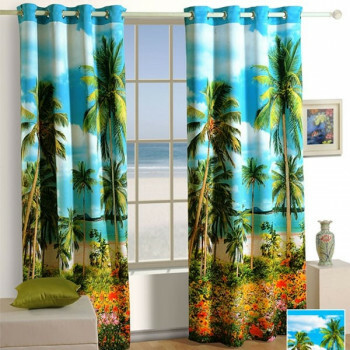 Draw your curtains and enjoy a cool pleasant time behind them. The thick texture will keep the sun away bringing in a shady ambience. 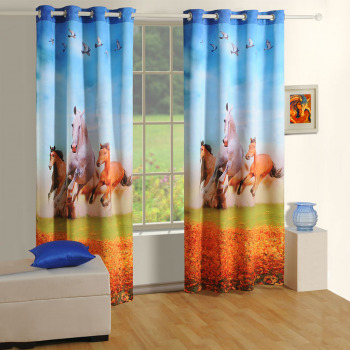 These lounge curtains are ideal during the winter season as it helps to insulate the heat. It also acts as a noise dampener keeping your home in a state of tranquility. They are thick and heavy therefore falls seamlessly to the ground without leaving any wrinkles behind. 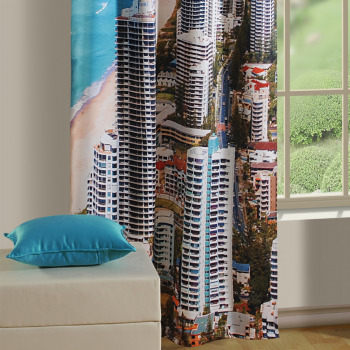 These digitally printed premium curtains will not only enhance the look of the interiors but the passersby will also see the beauty through the windows. 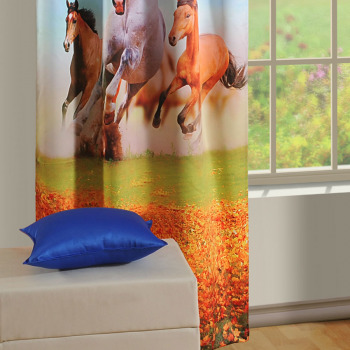 You can avail these in two different sizes for customize doors and windows. 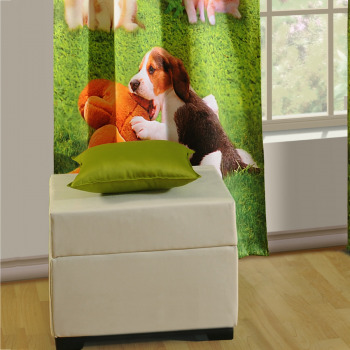 Lounge curtains will make your lifestyle much more interesting and appealing to the onlooker. 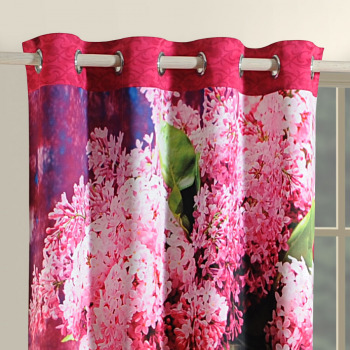 The vivid colors and precise designs make this curtain a world class product. They are easy to wash and require no special treatment. You can wash them in a machine and iron at low temperatures. 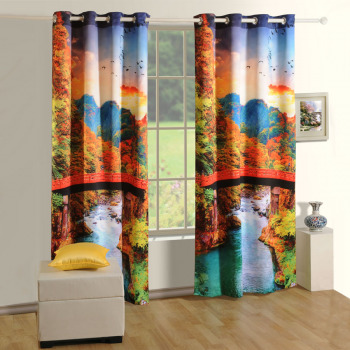 Being strong and colorfast in nature, these digitally printed premium curtains will ensure you a long term service.